For all you fellow podcast addicts out there, I’ve got big news for you. 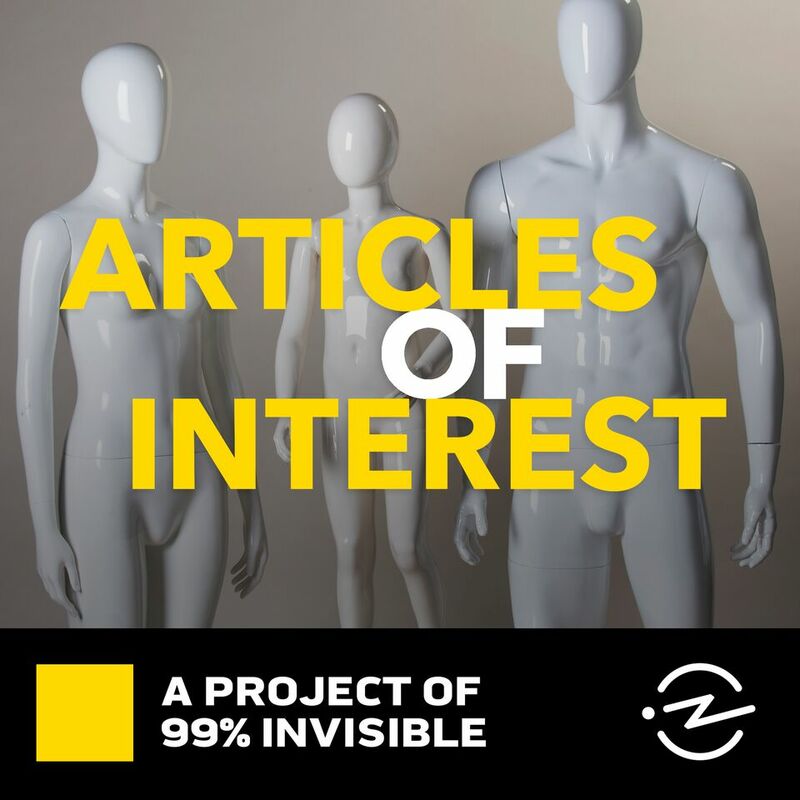 The world-famous design podcast, 99% Invisible, has launched a mini-series all about fashion called Articles of Interest. Last week I had the opportunity to interview it’s host, Avery Trufelman, about the series and her wider views on clothing and textiles. Here, explore Avery’s ideas on what makes fashion great, and some fantastic contributions from social media to discover the elements of a piece of clothing that people think make great fashion design. So far, Articles of Interest has two live episodes, one all about plaid (or tartan as we know it here in Scotland!) and one about children’s clothing, both of which have managed to balance education and entertainment in a really upbeat and accessible way. Future episodes will discuss a broad range of concepts including the rise of casual wear, the environmental impact of the textile industry, and why womenswear doesn’t have pockets. Together, the episodes link thematically, each one to the next, like a concept album on clothes. Though it may not seem this way to loyal listeners who are geeks about industrial design and architecture, Articles of Interest isn’t too much of a departure from what 99% invisible usually does; tells stories about design to achieve understanding, and observing the world around us. I was really curious as to why the 99% Invisible team have decided to tackle fashion as an element of design, and why now? Avery told me that she has had this idea since starting her journey at Radiotopia, and has always viewed clothing as a vehicle for culture, history and self expression, since finding inspiration from the punk subculture via a Vivienne Westwood exhibition in San Francisco. Avery acknowledges the vast problems within the apparel industry, but feels that we may as well find joy in what we wear and the autonomy of choosing how we present ourselves; after all, at the end of the day we all need to get dressed. What makes good design? For Avery, a newbie to the somewhat overwhelming world of fashion, it all starts with the ingredients. Just like with food, by using seasonal, local, organic, sustainable, high quality and natural components, the finished product will be so much better than with cheap, synthetic, untraceable ones. She believes that there is no need to buy new clothing to look good, and that you can work with what you already have to express yourself. Vintage shopping and thrifting are also key to ethical-izing her buying habits, and Avery thinks that you will dress better by embracing the challenge, and the individuality, of pre-loved clothing. Diversity is another topic that came up in our conversation, partly because I had just listened to the Articles of Interest episode on childrenswear, which began with interviewing a 4-foot-something man about the challenges he faces when shopping for clothing that fits, and lately I have also been obsessed with fashion activist Sinead Burke, who faces adversity in the retail industry as a little person. Avery told me that a common trope in industrial design is the Oxo Peeler; originally, this product was designed to be more comfortable for people suffering from arthritis, but it turns out that the Oxo was a better vegetable peeler than the old design anyway. Learning from this, Avery believes that we should be designing clothing for an ‘extreme’ or ‘minority’ group, not only to be more inclusive to those people, but also so that we can design better for everyone through innovation. Fashion brands need to start thinking with a more open mind, and expand their idea of who their customer could be. Read on to delve further into Articles of Interest and the ideas it hopes to reflect and explore. RM: How can we make fashion more ethical and sustainable? AT: Honestly, there are a whole host of solutions that I’m not very qualified to talk about!I think the sad truth of it is for the time being, we all need to pick and choose a bit. No garment is ever going to be entirely 100% ethical in every single way. We as consumers need to choose what our values are, in all the categories you’ve listed. I’ve heard experts say the best thing to do is pick a manufacturer you trust (Eileen Fisher is held up as a gold standard) and opt to buy new clothing from them. But honestly, I’m just going to buy second hand. That’s the easiest rule of thumb to remember and stick with. RM: How can ‘everyday’ people interact with design, and take what they are wearing and using on a daily basis more seriously? AT: I think a big thing is to talk about it! Just start conversing about what we wear, where we bought it, and what it means to us. Often times conversations like “cute shoes where did you get them” are categorized with the conversational purgatory of Talking About The Weather, but it’s really not like that at all. We need to talk about what we are wearing, and learn about brands and fabrics and modes of expression. Especially you, men. Go compliment each other on your outfits more. RM: What has been the best part of creating this series? Is there anything that you’ve learned or been surprised by along the way? AT: I’ve really radically changed the way I dressed, without buying too many new things. For much of this process I was doing interviews all over the world and living out of a backpack. I wore pretty much the same thing every single day, and was a smelly sloppy mess while I interviewed all these glamorous fashion curators and historians. By the time I got back home to my wardrobe, I was so excited to wear all my clothes and so fueled by all the conversations I had, I just began to rearrange my outfits in new ways I had never thought of before. So that’s on a personal level. But fashion really resonates on a personal level and has a personal impact. It may sound silly to say “I just started enjoying my own closet” but that’s really what I hope some people will get out of it. I hope listeners will take a fresh interest in the items they already own, and learn (just as I have recently learned) to mend and patch and fix the things you already have, and not rush out to buy new clothes right away. RM: What do you hope to achieve by creating this platform for quality conversation about clothing? AT: Honestly, I want people to really engage with their clothing and question why we wear what we wear. Especially men. There’s much talk of toppling the patriarchy, and a lot of that involves saving everyone from the oppressive forces of masculinity. Including men, who have such a limited range of ways to express themselves. Just today, I was talking to a friend about suits. Jackets and ties make him feel uncomfortable, but they are the only ways men are able to “look good.” It’s a pity. We should all be able to dress for our preferences- our bodies and our lifestyles. And it’s interesting, fashion is this real battle line between societal expectation and personal preference. And when we recognize these boundaries, we start to understand the decisions we make for ourselves and decisions we make to conform to larger societal expectations. We can better comprehend the roles we play by looking at the costumes we wear. RM: What are the three key things that make a great design/something well designed, be it clothing or anything else? AT: I think sentimentality is a key thing. If it came from someone you love, or a place far away, or a time in the past, it doesn't matter if a button is missing or there’s a stain on the knee. That’s a beautiful thing about clothing. Textiles are real spiderwebs for sentimentality. But I think this also applies to any number of design objects. Quality and good materials are another one. And then I guess the other (some would argue oppositional) factor would be novelty. Does it add something new and interesting to the world? I think there’s much to be said for making a statement. And if it’s done with care (and good materials) that’s what makes the best design. RM: In all the conversation about the problems within the fashion and textiles industry, people are feeling very pessimistic about the clothes they wear. How can we re-connect with the expression and individuality that fashion once was? AT: Throw a clothing swap. Invite your friends over and tell them to bring their old clothes. Put some music on, have some drinks, and spend a day swapping clothes and telling each other the stories of where they come from. You’ll get rid of your old clothes and get free new things, all while understanding a bit of the stories of their past lives. It’s the most sustainable and interesting way to dress. This isn’t an overarching solution, of course, but it’s a pretty excellent band aid. RM: What do you hope to see from the fashion industry in the future to make it more fair, clean, diverse, inclusive, and above all joyful? AT: That’s such a great question! And honestly I don’t know the answer. I am not a member of the fashion industry. I’m just a wearer, like everyone else, who has spent a few years thinking about it. I’m not well versed enough in the specific practices on the production side that need to change. But I do know that industry responds to the demands of consumers. So perhaps the change has to start with us all asking about who made our clothes, under what conditions, and where. I suppose we should all be asking questions like the very ones you just asked. Today is a helluva day to examine whiteness and notions of masculinity. Episode two of Articles of Interest is out now. It's about plaid. I have a question for you, Instagram... . WHAT MAKES GREAT FASHION DESIGN? . Is it quality, fabric, construction, brand aesthetic, sustainability, ethics, trends? What is your favourite fashion brand/piece of clothing/collection and why? Please let me know and help spread the word, I have an exciting piece coming out and I'd love to hear your views! Now, a question for you. What is your favourite fashion brand? Your favourite piece of clothing? Your favourite designer collection? And what is it about this which makes you love it so much? Let me know in the comments!